It is going to be very difficult to encapsulate the life of Nancy Daniels in the short time we have together, but I’ll try. To put this long and busy life into perspective perhaps it would help if I told you that one of her brothers, already by then a man, died in 1926 when Nancy was 10 years old. Bill, Nancy’s nephew, sent a card recently from Canada and he’s 88. Her life began in South Bank, a very industrialised town near Middlesbrough in the North East of England. Surrounded by steel works and docks, the long rows of terrace houses were kept immaculate by the women whilst the men went out to the ‘werks!’ It was a time of zinc baths in front of the open fire, the water heated in a copper boiler. In the winters there would be frost on the windows most mornings, and it would be on the inside. One tale that Nancy used to tell of those days was that she used to babysit Shirley Bassey. Of course the family used to think it was fantasy stuff, knowing that Shirley came from Tiger Bay in Cardiff. When the internet came along Paul meandered through the web and found out that Bassey’s mother came from South Bank and used to visit hermother in South Bank so Nancy had been telling the truth. In her mid-teens Nancy got a job in Bradford working as a nurse in a fever hospital and survived when others didn’t. She became the ‘downstairs’ part of Upstairs Downstairs when she worked, again in Bradford, for a family. Ever since friends and family have been regaled with tales of Madame Tempest, her wealthy French boss. By now she had met the love of her life and their courtship was astonishing. Hughie, to whom she was married for over 50 years, was working in a cinema and every Saturday night, after work, would pedal a bicycle from Middlesbrough to Bradford. Just getting up the hill out of the Tees valley would have finished off most men, especially as in those days bicycles were known as bone shakers and weighed a ton. When he arrived in the middle of the night the Tempest family let him sleep in the greenhouse and Nancy and Hughie could have a few hours together before he had to set off back home. Hughie and Nancy got married and Hughie got a job in a cinema in Mablethorpe on the East Coast, and settled into a bungalow called Lulworth. Both of them loved bungalows from that moment on but the most amazing thing was that when they commuted to visit family in the North East they went by tandem. Nancy was always on the back because the only time that ‘Dad’ let her onto the front she drove straight on at the first corner. It turned out Nancy could pedal but not steer. In 1938 Ted, now known as Paul, was born and Hughie made a sidecar for the tandem so that they could still make the journeys. When war broke out they moved back to the North East because everyone believed Hitler was going to land on the beaches of Mablethorpe. Early on their home in the north suffered a direct hit by a bomb. Thankfully bombs were smaller then so they survived. Hughie went off to the Royal Navy, came home for the birth of Trevor, and was then posted to India. In the ensuing years Nancy’s contribution to the war effort was mixing concrete and wheelbarrowing it into moulds to make concrete barrier fences. A tough job for such a tiny lady. In the many letters of condolences that have poured in from all over the world one descriptive word comes up many times, ‘fiesty’, and she was certainly that. During those long years of raising the two boys, she wrote to Hughie most days, always starting with a spelling mistake that meant she called him ‘Dear SWEATheart’… he never corrected her. Times were hard and, as she was so good at knitting, crochet, sewing and suchlike Nancy organised the women in the street who came to her house and all sat on Saturday nights making things like Clippy mats on wooden frames from old clothing that had been cut up. As they worked they would all sit listening to the radio, the big show being the Voice of The Man in Black… horror stories that would terrify the women. So much so that tiny, but feisty, Nancy had to walk them all home in the dark. Shortly after the war Nancy gave birth to a third brother, Keith, but so very sadly he only lived for a few weeks, having been born with a heart defect for which, even more sadly, shortly afterwards a cure was found. For the most part, however, Hughie and Nancy had a happy life together, according to Hughie that was because he always gave in, although there was one memorable tiff when he had had enough, picked her up over his shoulder and walked down the street, around the corner to her Mother’s home, went in and sat her on the high Mantelpiece, telling her Mother he’d brought her back and he left her perched up there, too high for ‘Nance’ to get down. Showing her fighting spirit someone told her that a young woman who was working at the cinema was making a play for Hughie. Without any hesitation Paul was shoved into the pram, along with a pile of nappies and baby stuff and she pushed him round to the cinema, confronted the girl and told that if that girl wanted Hughie she’d best have the whole deal and handed over the pram complete with child. The young lady left the cinema, no more trouble from that direction. Early education for the lads was conducted by the same teacher that had taught Nancy when she had been at Upper Princess Street school, a Miss Strickland. From there Paul and Trevor went to completely different styles of school, Trevor eventually becoming a teacher himself. One day Nancy asked Paul why had come home early and found out that he had sort of gone on strike because he wasn’t going to have his backside tanned with a plimsoll shoe by one of the prefects. That was the way it was in those days in old Grammar Schools. Even though the school was a bus ride of quite a few miles the pinny came off, the coat went on and she half dragged a very reluctant Paul back to the school, storming into the Head Masters office and demanding to know what kind of institution did he think he was running. Mr Barker, a big man, explained he had only recently come to the school and tried to calm the fireball down, a woman who was saying it was alright for him to give Paul the cane, but not the other pupils. Paul didn’t think that this was such a good idea but Nancy went for the throat and amazingly, over the coming weeks, all the rules changed. Fiesty. The years went by, and her life changed too. From the two up two down terrace house, via prefabs and nice houses, to going to West End shows and major music festivals where she would tell anyone within hearing distance ‘That’s my son’ pointing to whichever of them was performing at the time. 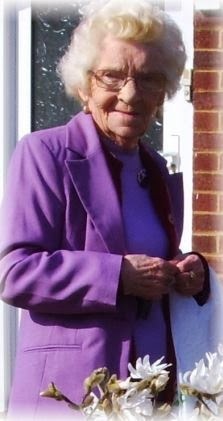 From mooching around on Uncle Eddie’s allotment to having her own gardens and how she loved gardens. From losing a child to enjoying her grandchildren, great grandchildren, nephews and nieces. In later life, with her beloved Hughie gone, and settled into her final bungalow, still called Lulworth, and even though the hair went from fiery auburn to silvery grey, the feistiness was always there. When a possibly charitable person handed Nancy one of those plastic bags to be collected the next day into which she could put anything they could use for the charity Nancy asked about the charity. It turned out to help Single Mothers. When the bag was collected the next day the collection lady was stunned when she looked into the bag. For Single Mothers Nancy had contributed packets of condoms. Neither Paul nor Trevor dared to go into the local chemists after that in case they were asked what their Mother was up to. Each person here will have their own memories of this woman who had her own style and such a long long life. This great cook, I am told many of you will miss the rum icing on the mince pies at Christmas, this Bingo loving, smoking, chocolate eating, fry up eater, defied all the odds to live a good long happy life. As for longevity, perhaps that was down to the magic in the never-to-be-washed teapot and the many tins of pilchards. Certainly the famed Angela Lansbury has put her long life down to strong tea and pilchards, perhaps we should all take these up. One of Nancy’s grandchildren, David, has suggested that the teapot should be donated to medical science. The family have asked me if I would publicly share their immense gratitude to Nancy’s amazing neighbours and friends who have shown her such love and kindness for such a long time, with especial thanks to the late Brian, to Kenny of the Christmas Cards, to the Newsagents whose profits are now so diminished due to the fall in cigarette sales, and there are not enough words to thank Judy, the greatest of neighbours, or the absolute Queen of Carers, Tricia. You are all so wonderful. Thank you for sharing this. I had to do the same for my Mum 3 years ago, and it brought home what a full life she had long before we, her children, came on the scene. Much loved and always missed. Mr. Daniels, I just lost my mother as well. I live in the Pacific NW in Washington state in the USA and my mother lived in the Midwest, in Indiana. We spoke each day on the telephone. I am a disabled veteran, and I have to drive a lot for medical appointments and for the volunteer work that I do on behalf of veterans in chronic pain. During these drives I would call Mother, and she would keep me company during my drives. I thought that I knew what life might be like without her, but I’d no idea. I miss her much more than I might have thought. 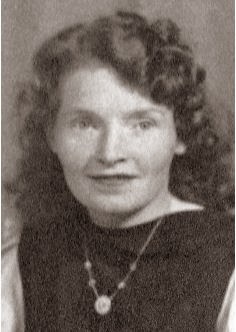 Mom was a ‘pistol’ and a real lady, too. Even after becoming what we’d call elderly, she still moved with the grace of a dancer. I am sorry for your loss sir, may you enjoy your lifetime of memories with such an extraordinary mother. That said, congratulations on your new products from Mr.de Matos! I am on a pension, but I’ll certainly save up and purchase, “Bravura,” when I am able. Amidst all the Spam and the Trash came your message and I am so glad that I managed to avoid deleting it. Thank you. I’ve just read this and appreciated the admiration and love you held for a wonderful Mam. She sounds remarkably like one Amy Dickens, wife to Donald Dickens, (remember?) and mother to Joan Scher, née Dickens, now 88 years old, who is also pretty feisty. It’s a Yorkshire trait. I doubt your Mam would have been as scared of creepy crawlies as Amy was however. I didn’t have time to read anything when I left a message a couple of days ago, so I’m glad I got up early to give myself time this morning. May you live at least as long as your lovely mother, and I’ll try and show this to Joan, ‘though she doesn’t get on with computers.